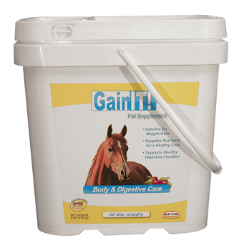 A premium concentrated, high fat supplement for horses. Aspergillus oryzae has been added to assist in digestion and absorption of essential nutrients and to support a healthy digestive function. GainIT! is formulated to provide extra calories needed for weight gain, support of normal physical and mental performance and healthy skin/coat condition while helping to maintain proper gut pH. Apple flavored. Omega 3 and Omega 6 fatty acids. For basic support of skin and coat condition: Provide 1 scoop (2 oz.) per day. Serving size based on an average 1,100 lb. horse. Adjust amount given according to body weight; more for larger horses, less for smaller horses, ponies or foals.